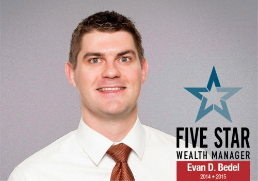 Evan Bedel, CFP®, has been selected to receive the 2015 Five Star Wealth Manager Award and will be featured in a special section of the October issue of Indianapolis Monthly honoring these award winners. This is the second consecutive year Bedel has been nominated and selected for the Five Star Wealth Manager Award due to his service, experience and industry knowledge. Evan’s Five Star award profile can be viewed here. The 2015 Five Star Wealth Manager award winners have been carefully selected for their commitment to providing quality services to their clients. The award is based on an in-depth research process incorporating peer and firm feedback with objective criteria such as client retention rates, client assets administered, industry experience and regulatory and complaint history.